A little over a year ago Victron Energy in association with Austrian Victron Energy dealer E-BOX Off-Grid Power Systems, together with HTL1 Lastenstraße and their headmaster Dr. Michael Archer forged a partnership to utilise Victron Energy products for their varied educational program – to build a ‘Competence Centre’. 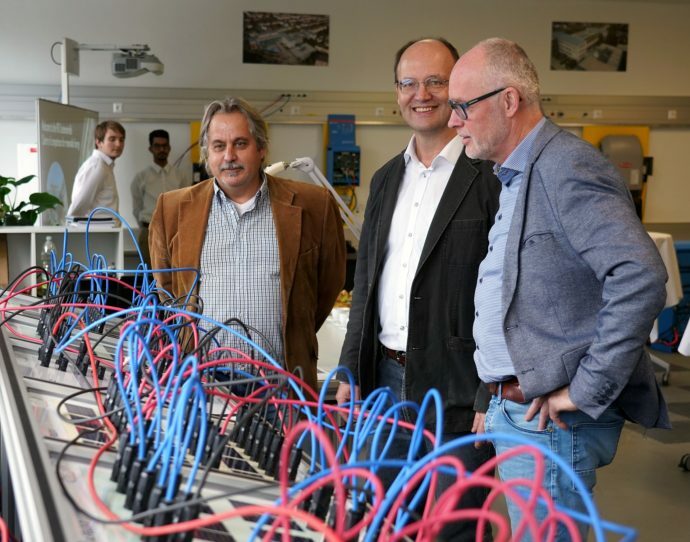 As a result on Thursday, 5th December 2018, the new VICTRON-Kompetenzzentrum (VICTRON-Competence Centre) for ‘Renewable Energy and Storage Technology’ was opened at the school. HTL1 Lastenstraße is a Higher Technical Institute in Klagenfurt, southern Austria, with around 1100 students and 120 teachers. The school trains engineers in the fields of mechanical engineering, electrical engineering and mechatronics. It has around 34 workshops and laboratories as well as several competence centres. Another focus is ‘Land und Umwelttechnik’ (agricultural engineering and environmental technology). This all makes HTL1 a unique training centre, not only for students from Carinthia but southern, eastern and western Austria. 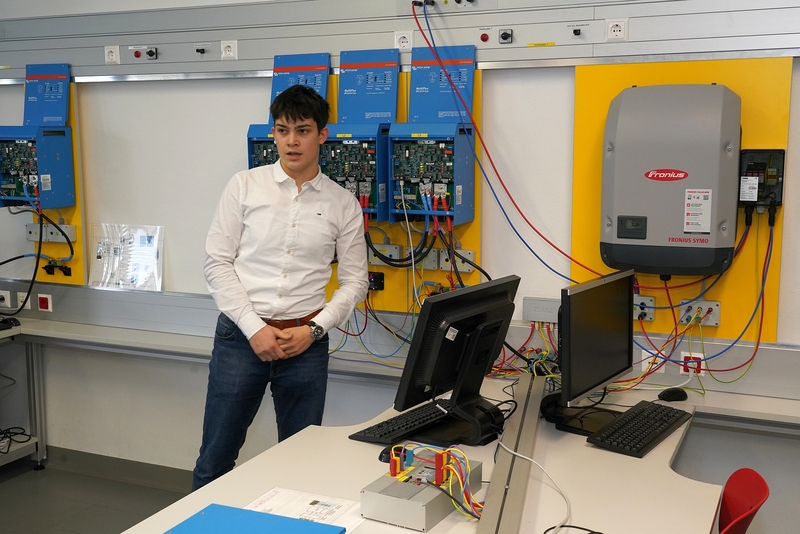 With the new VICTRON-Competence Centre training courses will specialise in the fields of energy storage technology, photovoltaics and energy management. Besides these courses Victron Energy have also been welcomed to run their own special courses at the school. In addition, interested companies will also have the opportunity to use this modern infrastructure for their own education and training events. 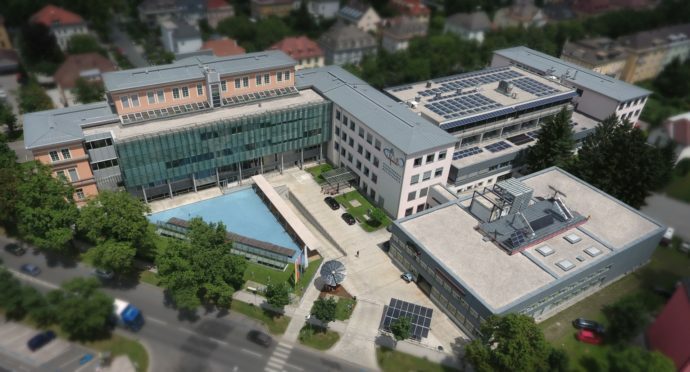 HTL1 Lastenstraße – The school is equipped with many different, modern photovoltaic-systems. The school were particularly pleased to receive a visit from Victron Energy sales manager Leo Yntema for the opening. Here’s a brief video (in German) of that visit and a few photos from the opening event. From left to right: Manfred Hartner – Managing Director of E-BOX Off-Grid Power Systems, Dr. Michael Archer – Principal of HTL1 Lastenstraße and Leo Yntema of Victron Energy. A student explains one of the 5 Workstations and its components at the opening. 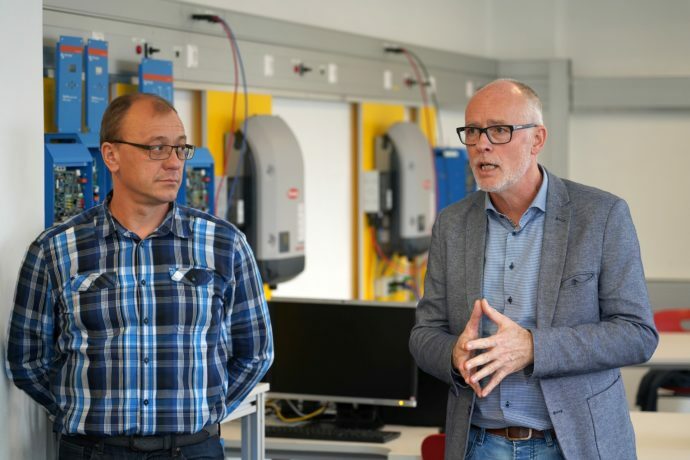 From left to right: Andreas Albel, the teacher who is responsible for the VICTRON-Kompetenzzentrum and Leo Yntema of Victron Energy. There are 5 workstations utilising Victron Energy equipment. 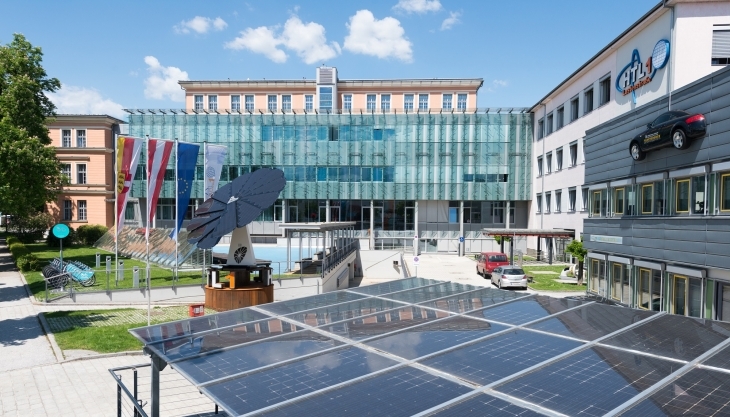 Each workstation is equipped with its own separate 3kWp photovoltaic-system, plus each of the panels can be switched on and off separately. It’s great to see the new VICTRON-Competence Centre now open and we trust it will serve as a valuable resource for the school and the young engineers of tomorrow.